6″ practice cake. Raspberry cake, raspberry filling and white chocolate icing. Dot and drag technique. Flowers are made from fondant. 10″ and 8″ white cake iced with vanilla buttercream icing. 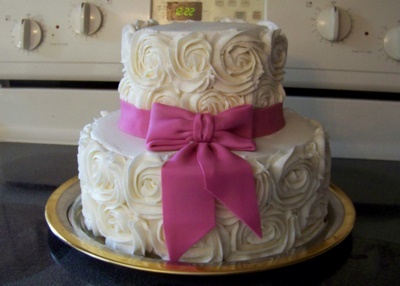 Bow and ribbon are made from fondant. 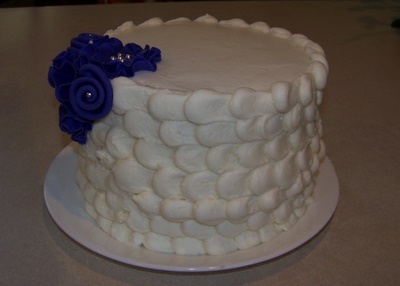 A small white cake iced with vanilla buttercream. 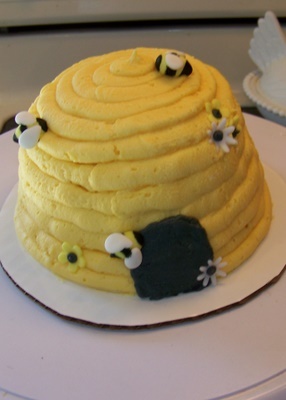 Bees and flowers are made from fondant. Made to look like a bee hive for a first birthday. This was the smash cake (personal cake for the birthday girl).